The 6th Ward Garden Park is a public garden offering people a place to experience nature, learn about plants, relax, and explore. Join us in creating an enjoyable space for the community that promotes ecological, social, and economic revitalization. We work to increase food security by empowering people to grow their own food. Get involved. Donate. Share the word. Come visit! Take a tour around the park with our interactive map to discover what's growing. What is the Garden Park? The Garden Park is a 1.1 acre city park in Helena, MT. This park is Montana's first public edible landscape. Half of the park consists of planted patches designed with nature in mind. The park relies on a gardening technique known as forest gardening that mimics the patterns and relationships found in woodland ecosystems. Fruit and nut trees make up the canopy, while berry shrubs and edible & medicinal perennials make up the understory and forest floor. In addition to an edible garden, the park contains gathering and picnic areas, a playground, and community garden plots for people to grow their own food. Who maintains the Garden Park? We all do! The park is sustained by a coalition of community stakeholders including Helena Parks and Recreation, Helena Food Share, Helena Community Gardens, Lewis and Clark Public Health, and community volunteers. 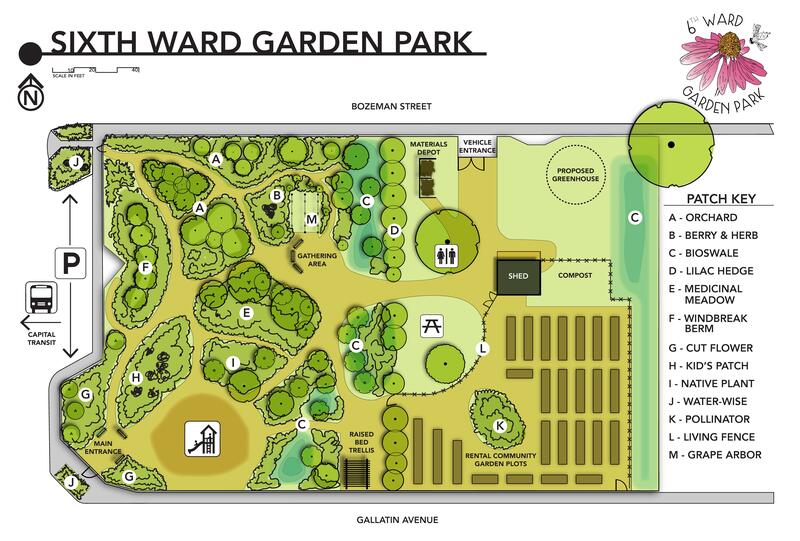 Planning for the 6th Ward Garden Park began in 2013, and it continues to evolve into an inclusive, engaging space where the community can meet, learn, play, relax, grow and enjoy food. We designed the park with nature in mind. Craig Marr and Pat Marron - Helena Parks and Recreation Dept.